^ a b Thomas, Ryland; Williamson, Samuel H. (2019). "What Was the U.S. GDP Then?". MeasuringWorth. Retrieved 6 April 2019. United States Gross Domestic Product deflator figures follow the Measuring Worth series. ^ a b Federal Reserve Bank of Minneapolis Community Development Project. "Consumer Price Index (estimate) 1800–". Federal Reserve Bank of Minneapolis. Retrieved 2 January 2019. ^ Baugher, Joe (30 June 2000). "Origin of the B-52". joebaugher.com. Retrieved 2 July 2017. ^ U.S. Government Accountability Office (12 September 1997). Air Force Depot Maintenance: Information on the Cost-Effectiveness of B-1 and B-52 Support Options (Report). Retrieved 11 August 2017. ^ Philipps, Dave (5 December 2015). 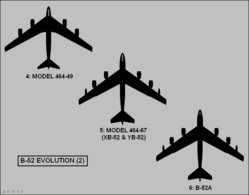 "After 60 Years, B-52s Still Dominate U.S. Fleet". The New York Times. ISSN 0362-4331. Retrieved 6 December 2015. ^ Weaver, Dustin. "US flies B-52 bombers near disputed islands claimed by China". The Hill. Retrieved 12 November 2015. ^ Yan, Holly. "U.S. B-52 bomber flies over S. Korea in solidarity after N. Korean nuclear claim". CNN. Retrieved 10 January 2016. 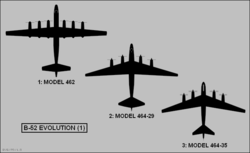 ^ "A Cold War Tragedy: B-52C Crash In January 1971 | Military History of the Upper Great Lakes". Retrieved 5 January 2019. ^ a b Weber, Bruce (15 June 2016). "Why We Celebrated the Beehive and Its Maker". The New York Times. Retrieved 6 December 2016. ^ Riggs, Ransom (20 July 2007). "A history of bad hairstyles". CNN. Retrieved 12 August 2016.